Ramblings of a Daydreamer: Blue Sky Days Launch Party - info + what you could win! 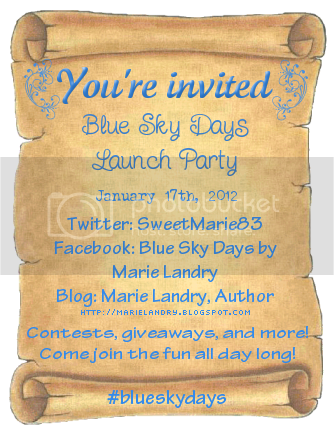 Blue Sky Days Launch Party - info + what you could win! Just three more days until the official launch of Blue Sky Days - eep! That means just three more days until the launch party and the blog tour. Double and triple eep! I'll be having two or three contests throughout the day. Each one will last for a few hours so that people have a chance to participate. There will be a prize for each contest. All you have to do to be eligible to participate is 'like' the page. Like Facebook, I'll be running several contests throughout the day, and each contest will have a prize. All you have to do to be eligible to participate is follow that blog through GFC and/or Networked Blogs. Wondering what the prizes are? 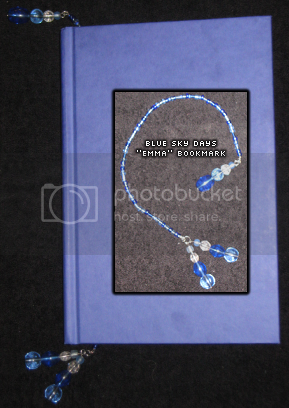 Well, I'll be giving away a few e-copies of Blue Sky Days, as well as some one-of-a-kind bookmarks from the Blue Sky Days jewelry line. Click the thumbnails below to see full-sized images. Sounds exciting Marie! Congratulations for getting to this point through talent, love of writing, and perseverence. I would like to buy a copy of your book and put it at the top of my reading list! Congratulations and I will certainly be around to help launch the novel. You go, girl! Congrats on the release of your new book! :) I will try to stop by the launch party. The book marks are very pretty. Wohoo! It's finally (almost) here! I can't wait to read your book and post my review!